Even investment returns on the VRS’s portfolio only modestly lower than the assumed 7% could prove devastating. “If the VRS fund only returned 5% annually each of the next five years, the State plan would see an increase in unfunded liability of approximately $2.2 billion,” the report says. In 2009-2009, financial markets crashed around the world resulting in the worst annual investment performance on record for VRS. This single event caused the funded status of the System to drop nearly 25% in a single year. Since that time, even with the pension reforms and more diligent funding of the state-wide plans by the Governor and General Assembly, the System remains at risk if another investment return “shock” were to occur. A less dire risk is that after a decade of superior investment returns, the VRS (and global markets) may revert to a sustained period of sub-par returns. Assuming a 7.0% average annual rate of return, a more conservative assumption than that of many states, the VRS calculates that it has a $5.8 billion unfunded pension liability, which at some point will have to be made up either by higher contributions from state/local government or cuts to benefits. If the average rate of return declines to 6%, unfunded pension liabilities would surge to $8.5 billion. One issue with amortizing unfunded liabilities over longer periods of time — such as 30 years — is that during the first nine or 10 years, the interest payments on the unfunded liability will be in excess of the amortization payment, which creates “negative amortization,” so the outstanding balance actually increases during the first eight or nine years … as payments to go toward interest rather than principal. As of June 30, 2018, the State plan legacy unfunded liability has 25 years of the original 30 years remaining to be paid with an outstanding balance of $7.4 billion. Under the current amortization schedule, $9.1 billion of interest will be paid over the next 25 years on the $7.4 billion outstanding balance. Shortening the amortization period to 20 years would save the state $2.5 billion in interest payments. The drawback is that employer rates would increase by about 1.7% of covered payroll over that period. Meanwhile, Virginia needs to consider other long-term funding risks. One is the risk that retired government employees might live longer than currently projected. A 3% increase in liabilities due to gains in longevity would cost statewide plans $167 million in total annual funding. Another risk is a decline in the number of employees contributing into specific plans within the VRS. For example, the number of correctional officers participating in the VaLORS plan has declined from 10,370 in 2008 to 8,717 active members in 2017 as the prison population has shrunk and the state has closed prison facilities. Actually, I give credit for them doing the stress test to know what the dimensions of the issue are and then to develop approaches to provide more certainty. And if we think about it, those in the private sector also have the same issue. Many folks with 401ks got whacked during the last recession and some had to work longer than they had planned originally. so we worry about the Virginia pension system “unfunded liabilities” but take a look at the average 401K those who are not govt employees have in their 401Ks. So an obvious question is how do we assess “unfunded liabilities” for these folks? Larry the G asks “So an obvious question is how do we assess “unfunded liabilities” for these folks?” That is folks that have 401k..
Don’t know about the rest of you but I’ve got enough problems of my own and it irritates me when government converts folks personal problems, irresponsibility, and dumb decisions by other folk into “our” problems. The first year the average Comm School graduate works after college nets $94,568! The average starting bonus is $9,261. I can understand UVA lending the money to students with poor parents. But giving away the education to young adults (first yearmen in UVA lingo) who have poor parents? Why? These students have every opportunity in imaginable to be financially well to do. The net effect is that the son of a hard working plumber has to take on not only the debt for his legitimate costs of education but the added costs of covering the “poor parent scholarship” program. The beneficiary of this scholarship goes not to the poor parents of the student but to the rich, young accountant who got to go to school for free. 1. – “we” make 401Ks tax-advantaged. In that we do allow people to put untaxed money into 401Ks and then tax it when it comes out when they retire. This DOES cost all of us in higher taxes so we can “pay” for that tax-free entitlement. 2. – People who do not save enough money for retirement – get entitlements paid for by the rest of us. For instance, we all pay the “unfunded liabilities” to provide folks with Medicare – at $134 dollars a month when the costs to actually provide it add up to a thousand dollars a month or more depending on whether they get basic Medicare or Medicare Advantage or Part D Prescriptions drugs – all of these are subsidized by taxpayers writ large. 3. – “we” ALSO provide tax subsidies for employer-provided health insurance as well as tax-deductible mortgages, charitable donations and out-of-pocket health expenses, child tax credits, earned income credits and college cost credits. This all comes at a cost of about a trillion dollars a year in deficits added to our 20 trillion-plus total debt. In other words – the State pension funds unfunded liabilities is just one of the unfunded liability issues. I have trouble calling these “subsidies” of those who don’t provide for their own retirement. But some of these ARE costs of the social-safety-net avoided, and therefore those ARE costs that retirees don’t have to provide for themselves if they’re willing to forego the comforts of retiring on more than the bare minimum. Another way to put it is, the bare minimum is all a lot of these folks are going to have. The safety net will keep them alive — but hardly comfortable. Others are simply life-style subsidies by our tax code unrelated to retirement. I hear many claim the safety net is not all that big for most people (say SSI for example). It’s not cheap but I think Larry’s argument somewhat overstates the burden taxpayers have when they don’t pay for expensive preventative measures up front. I can see making preventative services available upfront when those services are targeted to limited areas, are monitored for effectiveness and don’t break the budget. For example, I see value in identifying young children with say speech or hearing problems early on prior to their starting school. I also think making parenting classes available to young, often single, parents makes sense. But I don’t see going beyond Social Security and/or SSI for adults who fail to take any actions to prepare for their retirement. We have free will and have a duty to take care of ourselves. While a person who has lost his/her legs due to diabetes may need help, a person who makes stupid decisions or is flat-out lazy shouldn’t be given much beyond the bare minimum. Well… ANYTIME – you’re talking about income earned that is not taxed – it’s by definition – tax-relief and a government-granted subsidy. We should not CONFUSE what it actually is with what the avowed purpose of it is and judge it to be a societal value worth incentivizing. 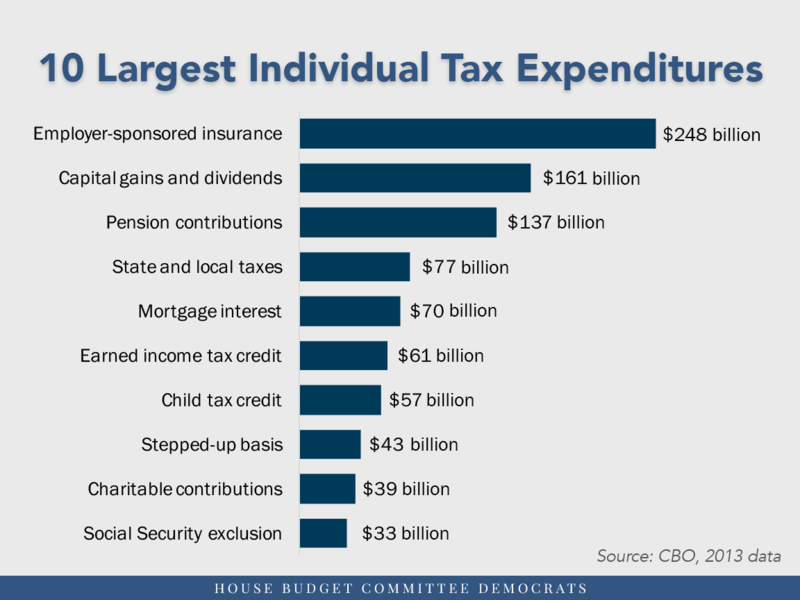 Most all of these tax expenditures only really apply to people who make higher incomes. Those at the lower economic levels at or below minimum wage essentially do not qualify for them with the exception of EIC and Child Tax credits. So – to take the biggest one – health insurance – where the lower level people usually do not get employer-health insurance – they ALSO do not get the tax-subsidy on it even if they purchase it themselves on the market. That’s a clear discrimination on the tax policy that has resulted in many in the lower levels who might be able to afford some level of basic insurance if they got the same tax break on the money to buy it. The irony is that we actually mandate this for Social security and Medicare that applies to everyone regardless of their income level and the purpose of it is to provide an income and medical care at retirement. What I’m arguing here is that when we talk about Pension systems at “risk” because they have “unfunded liabilities” – it extends beyond just public sector employees AND that the Govt is ALREADY subsidizing pensions – public and private and no shortage of critics about the unfunded liabilities of Social Security either. We just continue to do round-robin narratives here of chicken-little , the sky is falling over pensions… tale… over and over. And the bigger picture, at least to me is MORE than just the unfunded liability issue – it’s what the role of govt should be (or not) when it comes to retirement – not just public-sector pensions – but private sector as well as Social Security. Is it a proper role of govt to involve itself in pensions? and not the least of which is that it is Govt that REQUIRES the transparency of pension systems – like VRS. We only know what we know about those unfunded liabilities BECAUSE the govt REQUIRES that information to be provided to all of us.